One of the top matchups in the jumps will take place in the girls 15-16-year-old division. Mt. Airy's (PA) Tia Taylor is the defending champion in the 14-year-old division and is looking to earn her second straight gold with the age-up. She'll face her best competition yet, however, in India Turk, the Georgia athlete who recently produced a wind-legal mark of 19-4 (-0.7) at the AAU Club Championships. Taylor has a best of 19-3, though she accomplished that feat in April and hasn't quite gotten back there since. Expect this battle to really have some firepower. Turk also comes back in the triple jump, where she's the top seed with a mark of 39-4. In the girls 13-year-old division of the long jump, the pre-event leaderboard is a little deceiving, too. While Infinity's Avery Lewis is the second seed, she's probably the operative favorite. 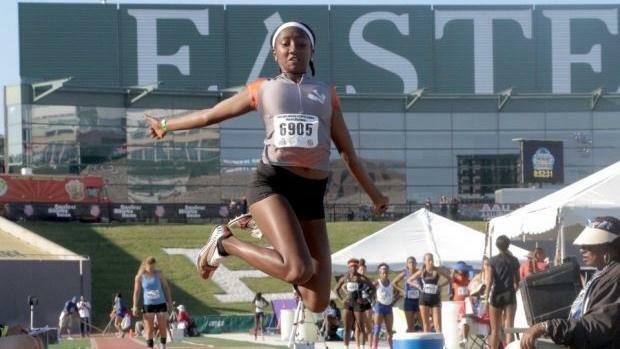 She smashed the 12-year-old national record last year and has a best of 18-10 from just a few months ago. The division's top seed, Anna Jennings, enters with a top mark of 18-1. Meanwhile, in the 10-year-old high jump, D'asia Duncan won last year's competition as a 9-year-old, but she isn't the top seed a year later. That shouldn't matter much. Duncan has the experience and enters with a top mark of 4-0. In the boys competition, one of the top storylines to watch is in the boys 17-18-year-old triple jump. Duncanville Track Club's Deandre Stapleton Jr. is coming off a mark of 48-8.5 at the AAU Regional in Burleson, Texas, and will be looking to hit 50 feet at nationals. The top seeds in the boys 15-16-year-old and 17-18-year-old pole vault divisions--Montana Welch and Nathan McFail--are also confidently hovering around the 15-foot mark. Expect both athletes to make a case for that height. Another athlete looking to add to his national tally is Memphis Mustangs' 15-16-year-old Aeneas Reed, who just finished up his freshman year at Houston High (TN). The versatile hurdler, jumper and multis athlete won titles in the long jump and pentathlon in 2017 and is coming off a seventh-place performance at states in Tennessee in the long jump. While Reed is focusing on just two events this campaign--the 400mH and LJ-- he's ranked No. 3 in the long jump with a mark of 22-4.50, just a few inches short of the leader, Trey Thomas (22-8.5), an athlete based out of Houston. And in the high jump, a recent Shawnee Mission West (KS) graduate will look to sky higher than he's ever done before. Jack Durst, competing for Hot Feet Track in the boys 17-18-year-old division, cleared a best of 7-feet at the AAU Region 15 qualifier. He's the only athlete in the Games to have achieved that impressive feat. So the only question that remains is this: How high will Durst go at nationals?